Wow, how is it already the middle of May? Time is flying. Before we get into all the fun stuff we’ve been up to this month let’s do a quick recap of April. Our goal for April month was to chill the eff out. As evidence from some previous posts, we go through phases of excitement and exhaustion. After talking with other travelers, I’ve come to believe this is a totally normal part of life on the road. 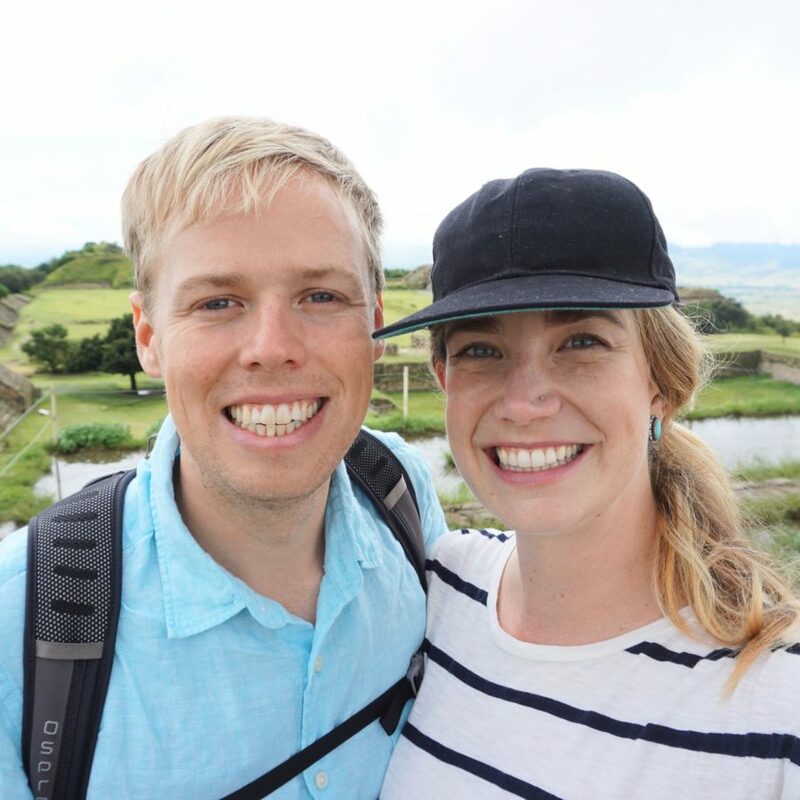 Going into month 8 we were starting to feel the effects of long term travel. We were feeling physically run down and starting to notice occasional moments of anxiety were slowly increasing. So we took most of the month to hit the reset button by not focusing on traveling but focusing on ourselves instead. Travel has not be easy on our bodies. I’ve read about long term travelers who find creating a routine, working out, and eating well come much easier to them while they’re traveling than when they’re home. That just hasn’t been the case for us. We’ve gone through stages of being pretty healthy but especially over the last few months we’ve fallen into a cycle of sleeping in, over indulging in drinks and dessert, spending too much time on social media, and generally feeling unproductive and unhealthy. This month we decided to really work on that. We purposely stayed at hostels near gyms and we made it a priority to get some real, heart pumping, muscle working exercise almost every day. We chose to spend a bit more than usual on big salads or vegan noodle soups over our beloved, super cheap, but not super healthy street food pad thai. We took a break from alcohol for most of the month which worked wonders for our sleep and digestive health. We also spent almost every afternoon working on this blog or other creative projects which helped ward off the restlessness that had been creeping in. All of this helped us recenter and refocus. We learned again, how great we feel when we get a bit more cardio and lay off the mango sticky rice. We also reminded ourselves that just because we’re on the road, doesn’t mean we have to spend every day as a tourist. Becasuse, if we’re not feeling well, we wont be able to enjoy the travel as much anyway. Before we got to Chiang Mai, visiting the elephants was the only activity we had planned. I went last year when my sister and I visited Thailand, and I didn’t expect to enjoy hanging out with the elephants as much as I did, but I was completely awestruck by how gentle and powerful these creatures are. With the combination of spending time with the magical beings and the thoughtfulness of the tour guides and the park itself, I knew I wanted to share share the experience with Jeff. We had a wonderful day at the Elephant Nature Park. We spent the morning with a small group of elephants that live in a nearby village. We fed them, went on a long walk through the jungle, and bathed them in the river. Then after lunch we were given a full tour of the park and were able to observe even more elephants there. It was a terrific day with a full post coming soon. We love Thai food at home and even in health mode, we still end up eating curry or pad thai almost every day. 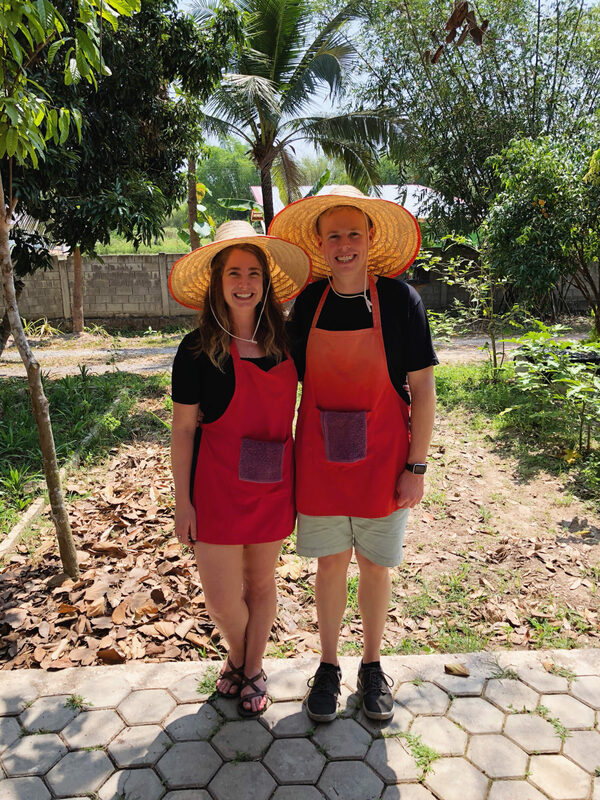 So after hearing some rave reviews of the Thai Farm Cooking School we decided we couldn’t pass up the opportunity to take a class. It did not disappoint. As part of the day long class we were given a brief tour of a local market as well as a tour of the school’s farm where they source all of their herbs and most of their veggies. Our teacher was feisty and had a great sense of humor which made learning from her so much fun. We made a feast of spring rolls, coconut soup, curry, and mango sticky rice. We left stuffed and ready to host a thai food dinner party as soon as we have a kitchen to call our own. We nearly missed a major disaster this month. After 7 months of traveling we were starting to believe we had it down. We can pack our bags in 20 minutes, we can navigate an airport like pros, and we’re even getting good at our bargaining skills. But it wasn’t until we were chatting with a woman in our cooking class that we found out Thai tourist visas only last 30 days. With our slow, relaxing, month of health we had planned to stay in the country at least 6 weeks. After traveling in South America where most countries give 90 day tourist visas, it didn’t even occur to us to check how long Thailand would give. Rookie mistake! So the next day we crossed our fingers and headed to the office. If we weren’t able to get our extension we were going to have to leave the country because it was the day before the Thai New Year when all the offices would be closed for 5 days and our visas were going to expire in that time. As we were on our way, the staff at our hostel warned us of the horrible waits and that we might not be seen because we weren’t there first thing when the office opened. We showed up around 11, waited in line for an hour, and right when we got to the front of the line they closed for lunch. We got some coffee as we waited for them to reopen. We stood in line for another half hour and dropped off our passports and paperwork. Then we waited in a packed room for about 3 more hours while our visa application was being processed. Finally we were given our passports back with a big shiny sticker inside that said we could stay for 30 more days. Overall it wasn’t as terrible an experience as we expected it to be. We celebrated with street food pad thai and a big ol’ sigh of relief that we could keep hanging out in this country we’ve grown to love. Later in the month we made our way to Koh Phangan. The story of how we got there is one for another day but suffice to say by the time we arrived we were so ready for weekend of total relaxation on the beach. We were so smitten with the island that we extended our initial stay of 3 days to an entire week. Koh Phangan is a pretty underrated island. 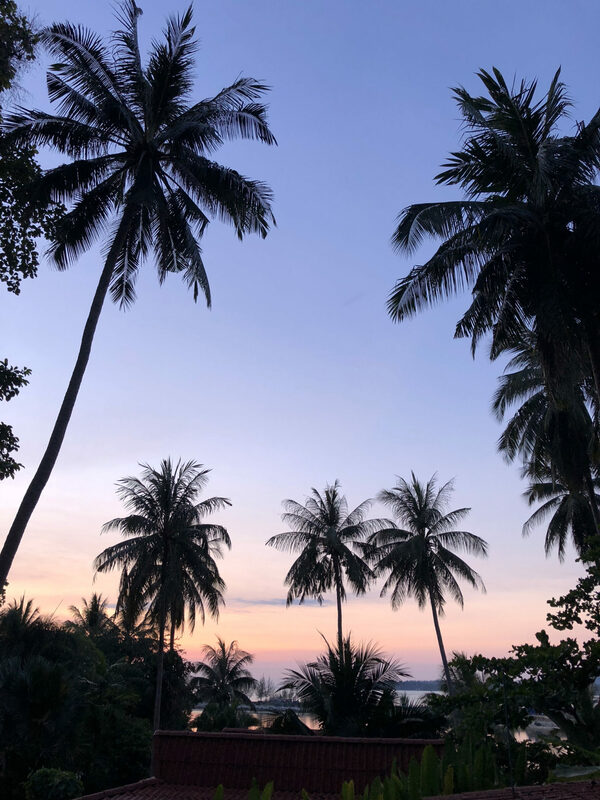 It’s mostly known for it’s wild Full Moon Party, but I had heard that much of the month it was a laid back place full of hippies, yoga studios, vegan restaurants, and small beachside bars. Usually we tend to prefer places locals hang out, but in the midst of our relaxation month it sounded like just the place to continue our theme of healthy food and active rest. The island turned out to be exactly what we needed. We stayed in a little bungalow with a small kitchen so we have a few home cooked meals. We rented a scooter which was scary at first but by the last day we were having a great time cruising around the entire island. And of course we spent most of our time lounging on the beach with a book, or if it was sunset, a Chang beer in hand. It was a was a perfect week of quiet down time and it turned out to be one of my favorite places I’ve ever been. After our week of relaxation on the beach, we headed back north because I had plans to do a 10 day meditation retreat in the mountains of northern Thailand, at the Wat Pa Tam Wua Forest Monastery. I was nervous about what to expect going in but I was pleased the entire experince was a lot softer than I expected. I didn’t leave with any major insights or a profound shift in my mental state, but I did feel calmer and more centered than I’ve felt in a long time. This too, deserves an entire post of it’s own. After a very successful month of commitment to our mental and physical health, we’re ready to hit the road again. We’re spending three weeks traveling through Laos from Huay Xai on the boarder with Thailand to Vientiane. 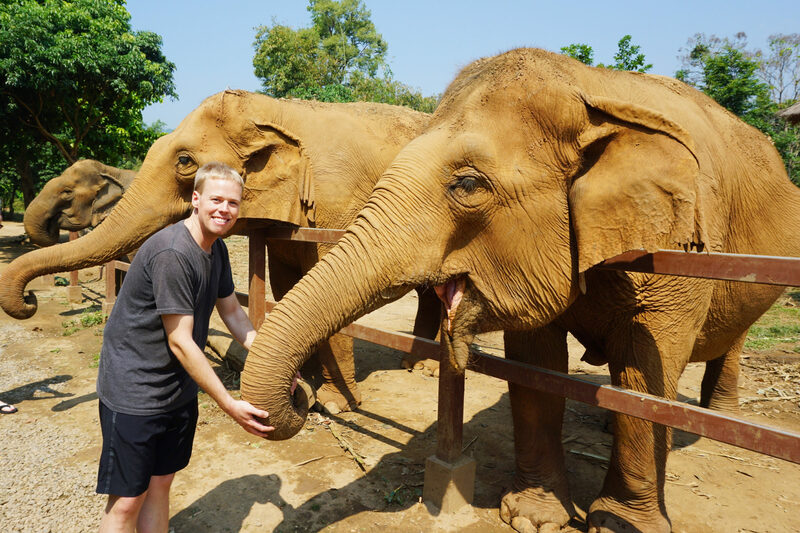 Then heading to Cambodia so I can hang out with elephants again, for a week this time at the Elephant Nature Park outside of Siem Riep. Thanks as always for following along.